“It is the precious privilege of teachers and parents to co-operate in teaching the children how to drink in the gladness of Christ’s life by learning to follow His example. The Saviour’s early years were useful years. 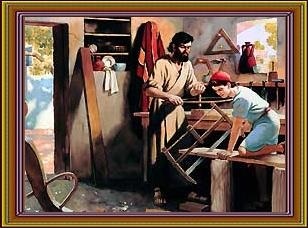 He was His mother’s helper in the home; and He was just as verily fulfilling His commission when performing the duties of the home and working at the carpenter’s bench as when He engaged in His public work of ministry. “The Saviour’s life on earth was a life of communion with nature and with God. In this communion He revealed for us the secret of a life of power.... Working at the carpenter’s bench, bearing the burdens of home life, learning the lessons of obedience and toil, He found recreation amidst the scenes of nature, gathering knowledge as He sought to understand nature’s mysteries. He studied the word of God, and His hours of greatest happiness were found when He could turn aside from the scenes of His labors to go into the fields, to meditate in the quiet valleys, to hold communion with God on the mountainside or amid the trees of the forest. The early morning often found Him in some secluded place, meditating, searching the Scriptures, or in prayer. With the voice of singing He welcomed the morning light. With songs of thanksgiving He cheered His hours and brought heaven’s gladness to the toil-worn and disheartened.